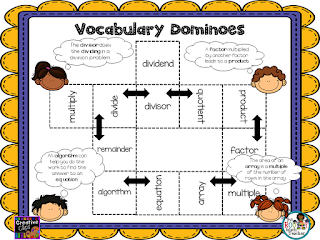 Click here or on the image above to grab a free copy of my "Vocabulary Dominoes" template. To use the download: Insert the image into a Word document or PowerPoint slide. Just add a text box with each word you want to add and place it in the center of each half of the domino. Head on over to The Routty Math Teacher website and read more about using Vocabulary Dominoes as an assessment strategy here. And, while you're there, grab a free copy of my vocabulary activities eBook. Check it out here!